What's better for you – fresh, dried or frozen fruit? “Eat more fruit and vegetables” is a common recommendation, but there are mixed messages about how healthy fruit really is. Some say its sugar content means fruit isn’t as healthy as many experts suggest. Others suggest fruit is healthy as its sugars are natural and are contained in the fruit’s cells. It’s thought we eat less of sugar contained in fibrous cells as it is more filling; we also absorb it more slowly than “free sugars” found in sugary drinks and processed foods. Then there’s the range of fruit products you can buy – including traditional dried fruits and the newer freeze-dried products. So, when it comes to eating healthily, which fruit is best? And how do these fruit products compare? The idea that fruit is good for you is largely based on the fact that many fruits have a low energy (calorie) content and are packed with nutrients. Nutrients include vitamins, minerals, fibre and bioactive nutrients (often pigment compounds known as polyphenols and carotenoids). Fruit also contains sugar, and the content can vary considerably. Some are very low in sugar, like cranberries (3.5 per cent sugar) and blackberries (1.5 per cent). But some tropical fruit contain surprisingly high levels. These include mango (14 per cent sugar) and jackfruit (19 per cent). The type of sugar in fruit can also vary according to the type of fruit and also how ripe it is. Generally, the most common sugar in fruit is fructose, typically making up 40-55 per cent of the sugar in most fruit. Sucrose (normal table sugar) makes up most of the rest. While some people say fructose is worse for you than other sugars, there is limited evidence for this. How does freezing affect fruit? Freezing tends to involve minimal processing, with only brief heat treatment before freezing to stop enzymes breaking down the fruit that would otherwise lead to spoilage and flavour changes. Freezing generally is a good way to preserve nutrients compared to other methods like canning and refrigeration. This is mainly linked to the relatively short period of heat treatment used to blanch food before freezing compared to longer heat treatments for canning. Thawing should not lead to significant nutrient loss. However, the effect of ice crystals damaging cells during freezing soft fruit can lead to the fruit turning to a mush and then water soluble vitamins and minerals leaking out. How does drying affect fruit? Drying (losing water) concentrates the fruit’s sugar dramatically. For example, apricot sugar levels rise from 9.5 per cent when fresh to 54.2 per cent when dried. This is why some have described dried fruits as like sugar bombs. Although the World Health Organisation does not classify dried fruit as something we should limit in the diet. Dried fruit can also be six times higher in energy than their fresh equivalents, due to a concentration effect through the removal of water. So, if you are trying to watch your weight, it would be sensible to watch your serve sizes of dried fruits. But it’s not all bad news for dried fruit. Drying increases levels of some vitamins and minerals, again through the effect of concentrating the nutrients when water is lost. 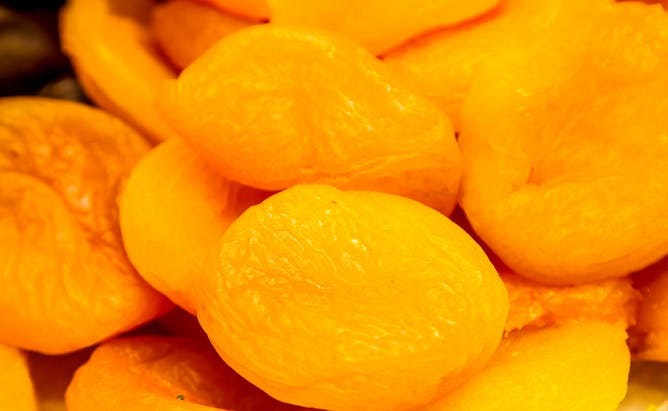 This means a 30g serve of dried apricots can contain more than 5 per cent the daily recommended intake of iron; you would need to eat 175g of fresh apricots to get the same amount. Freeze-drying involves first freezing a fruit and then placing it in a vacuum under very low pressures. Low pressure causes ice crystals to rapidly sublime, turning them straight from solid ice into water vapour. This process removes water much more efficiently than traditional drying. Effectively, the fruit’s water content is reduced but the fruit’s structure is maintained. This makes this method of preserving food particularly suited to soft fruit, like raspberries and strawberries, which are low in sugar. 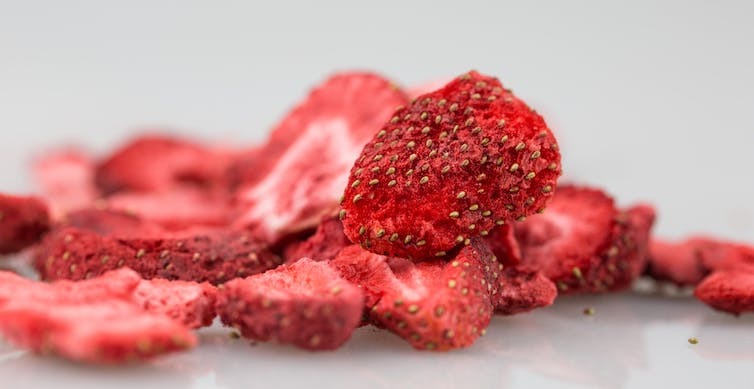 Freeze-drying is said to be one of the fastest-growing trends in food, with sales of freeze-dried fruit forecast to reach US$66.5 billion by 2021. While the public perceives freeze-dried fruit as a healthier alternative to candied fruit and possibly dried fruit, freeze-dried fruit has a much higher sugar content than its fresh equivalent. And as freeze-drying is a more efficient way to remove water than traditional drying, it can mean per 100g, freeze-dried fruit can contain more sugar than dried fruit. So, fresh strawberries contain 4.9 per cent sugar. But freeze-dried strawberries contain 71 per cent sugar, a 14-fold increase. That’s a sugar content similar to some lollies. Like freezing, freeze-drying helps to preserve nutrients. However, we will still see losses in these, especially vitamin C.
But as freeze-dried fruits contain less water than fresh fruits, you could end up eating more pieces of them than fresh, which means more nutrients (but also more energy and sugar). The bottom line is to try and eat more fruit, in the least processed form possible, ideally fresh. And if you choose dried or freeze-dried fruit for convenience, these contain more concentrated sugar than the original fresh product. Article authors: Duane Mellor is a senior lecturer at Coventry University; Ekavi Georgousopoulou is a research associate at the University of Canberra; Nenad Naumovski is assistant professor in Food Science and Human Nutrition at the University of Canberra, and Senaka Ranadheera is an early career research fellow in the Advanced Food Systems Research Unit, College of Health and Biomedicine, at Victoria University.